The boys were in fine form, Crowley was delicious, and the angels were… there. A mixed bag of emotions and drama on this episode of Supernatural. Oh, Demon!Dean. You’re so much fun when you’re so, so bad. Just a shame that I believe his walk on the dark side is soon coming to an end. That is, if Sammy has anything to say about it. Just to get it out of the way, since the storyline was a bit separated, let’s talk about the angels first. 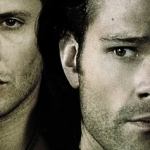 I will admit that I’m a harsher critic of the angel plotlines than I am the others, especially when they do not tie into the Winchester arc as clearly as one would like. So far this season, Cas and his journey has been very much separate from the Dean/Crowley/Sam triangle that has intrigued me. It feels unbalanced, especially since the angel arc seems to be dragging along. Cas’s descent into death is continuing, but there hasn’t been any large drama as of yet. I was uninterested about his and Hannah’s journey and I was meh about seeing Metatron pop up again. I was hoping we had left behind the failed writer in the close of his story last season. How much of a role will he play in Cas’s eventual regaining of his grace? I feel like we’re supposed to be invested in both Metatron and Hannah, but instead I’m just counting down until one or both of them dies. Until then, I’ll power through their scenes and await the Winchesters. We finally found out why Cole hates Dean so much. The elder Winchester took out Cole’s father back in 2003, when Cole was just 13 years old. Pretty sure dear old dad was possessed or a monster, but Cole doesn’t realize that. Instead, he’s been committing his life to killing the monster that killed his father. You really have to think about how the Winchesters, or any hunters, approach civilians in these kinds of cases. Do you take out the monster and move on? Or expose the dangers of the supernatural to those who are unaware? In Cole’s case, he saw Dean as a murderer, not a savior. There are probably plenty of other people like Cole out there, left behind after a traumatic death of a loved one at the hands of a hunter. As an aside, I’m always intrigued when they do a callback to past cases, especially when they de-age the boys. The combination of effects and long-gone character pieces let us relive the memories for just a bit before returning to the present. Realistically, John should have been on that case with him. Unless that was during one of the times they split up. Dean was just coming into his own as a hunter around that time, proving his worth, so it’s possible he didn’t approach the case with the same care as a more experienced hunter might have. I wonder if Dean will even remember the case when he becomes human again. And I wonder how much more danger Cole will bring to the lives of the Winchesters as he continues his mission of vengeance. While Cole was off torturing the younger Winchester, Dean was off living up his demonic life. The extreme beating he laid down on the bouncer at the strip joint was a bit excessive, but it was a good signal of how far off the deep end he’s gone. 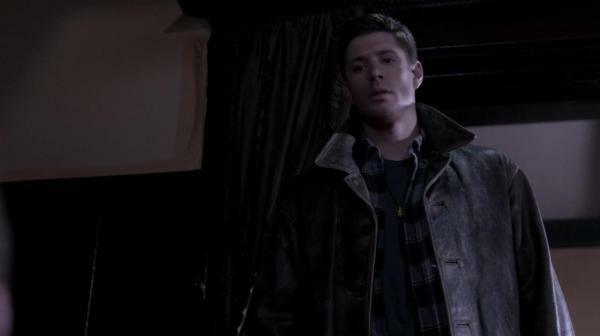 Dean has conflicted morals, with blurry lines of what he will and will not do. On one hand, I love seeing him play bad. But, on the other hand, the impact he’s having on his brother is breaking my heart. And the impact he had on Crowley wasn’t far behind. Crowley is definitely trying to use Dean to his advantage, but he’s not going to be some demon on a leash. Crowley cannot control him, and he soon learned that. However, it was nice to see David Nykl pop up as the husband that sold his soul! 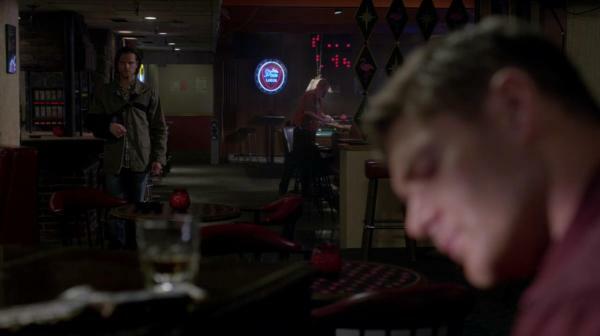 Too bad Dean killed him, instead of the cheating wife. 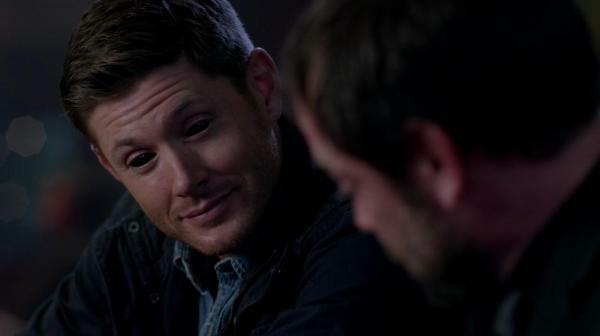 Again, Crowley may think he can control Dean, but the hunter-turned-demon is not going to play anyone’s game. He is out for his own enjoyment, and he will beat down anyone who gets in his way. I will say that the break-up between him and Crowley had me sympathizing with the King of Hell. He’s a bit heartbroken over the break-up of their duo act. The memories, the photos on his phone, so funny and sad. And now that he has the First Blade, what will he do with it? Is he going to gain the Mark of Cain when it’s all said and done? I am looking forward to seeing how the brother versus brother fight will go down. 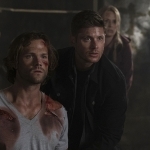 All the bad things Dean keeps saying are breaking Sam’s heart, but it’s not going to deter him from trying to save his brother. Even though he gets knocked out, like is common, at least he had enough presence of mind to douse Dean with holy water and cuff him in order to get him back to the bunker. Now we have to wait to see how that confrontation will play out. And when Dean comes back to his senses, will he kick himself over the uncaring approach he took to the car? You know it’s bad when Dean doesn’t care about Baby. Playtime’s over. Now it’s time for the real drama to begin. Love the review. I am loving Sam’s quest to find Dean, and Dean’s dance with Crowley (and, oh, when they played “Oh Lonely Girl” while Crowley looked sadly at photos of them together on his phone). The Cole story intrigues me, and I can’t wait to know more about him. I’m even feeling more patient with the Cas and Hannah story this week – the scene with the little girl and Cas was adorable. I am looking forward to how much damage Cole is going to do, and hopefully Cas’ story will become more integrated with the Winchesters now. So much potential. Just gotta see how it all plays out!